The children who attend public school in our region do not get free textbooks for school. There is a fondo of libros which is maintained by the city government where used books are available in a limited quantity. 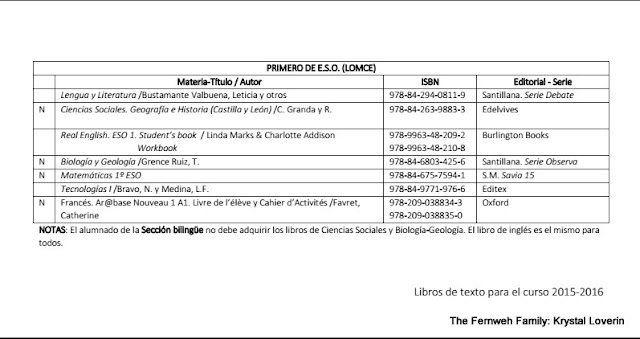 The books for the following September are ordered the prior March so parents can have an idea of what is available and then they are picked up the week before school starts. Mia is in the Second Course of the Public College i.e. 2nd grade in elementary school. Erika got placed in the First Course at the Institute of Secondary Education i.e. 7th grade in high school. We were able to get 3 of Erika's required textbooks from the Fondo but we had to buy the others. The Mathematics book, Matemáticas. 1 ESO. Savia cost 29,35€. She is taking the bilingual track so her Biology/Geology and Geography classes are taught in English. Each of those books were an additional 35€. I asked one of my professors why these classes were chosen to be taught in English since the vocabulary is more specific and would be more difficult to understand for the students. Who goes out into the world and using a second language to discuss science matters? My professor told me it was because they are not considered to be the important subjects so it's okay if they don't completely grasp all of the information that is being taught. My jaw dropped open and I was left speechless. Way to go Spain, way to go! While that was a relief to only have to buy half of Erika's textbooks, her art class sent her home with a laundry list of supplies to purchase! I still have no idea what half the things on the list are and Google and Amazon.es only got us so far. We had to buy every book on Mia's list since she writes in most of hers. I think that all told we spent about $500 on all of their books, supplies, backpacks, outfits for PE, and the like. To be honest, this was not an expense that we had budgeted for at all and certainly not what we expected to be faced with during our first week here in Spain. Mia's school started on September 10th and Erika's started on September 17th so we had a little time to get one started before the next. 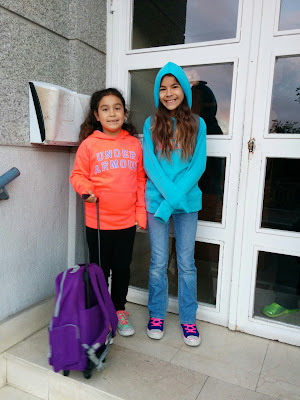 We had to wait for the official phone call that Erika had been placed at the high school next door to Mia's school and they waited until the very last day. They didn't ask for anything except the confirmation that she had applied for her TIE and her NIE number. Erika goes to school from 8:25am to 2:25pm and Mia attends from 9am to 2pm. There is no breakfast or lunch program and children are not expected to bring meals from home, just a simple snack like a piece of fruit or cookies. There is a cafe in Erika's school where she can buy a tapa or drink or something small for a euro or so. Mia has a snack schedule at her school. On Monday, she can bring cookies, Tuesday/Thursday fruit, Wednesday a bocadillo, and Friday is free choice. The girls have October birthdays which means that they were held back a year in the United States since their birthdays fell after the first day of school. Here you are assigned to your grade based on the year of birth so Mia would be 3rd grade and Erika 8th. Mia had to suffer through a week of 3rd grade before they finally got permission to put her into 2nd grade. We were able to get that figured out for Erika before class started so she joined into her group on the first day. There are no lockers in high school so the students have to carry all of their books back and forth each day. Since their schedule is different every day, they pack their backpacks each night before bed so they are ready in the morning. Erika and Mia receive 3 to 4 hours a week of specialized classes to assist them in learning the Castellano language. The girls have grown up hearing us speak Spanish but neither of them have had to use it outside of the time we spent in Mexico last year. Now they are forced to use it during school hours so it has put a lot of pressure on the girls to learn quickly. After all, this is why we're here. They need to learn Spanish once and for all if they hope to be able to continue communicating with their family. Their Tía Isabel is writing them letters from Mexico so the girls are practicing their written Spanish as well sending letters back and forth. It's probably one of the first times that our family in Mexico has ever written a letter and sent it as well. It's not a very common thing, even before the advent of emails and internet. That's not to say that there isn't a lot of letters going back and forth from the United States as well. I don't care how easy it is to write an email, nothing beats the sheer joy of spotting a handwritten letter peeking out of the mailbox when you get home from school. If you'd like to exchange letters with us while we're here, please don't hesitate to send me a message with your address. 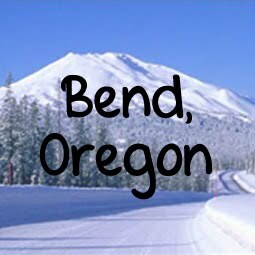 We'd love to keep in touch and send postcards, letters, and other small gifts. Interesting perspective. While it's not uncommon to pay for texts in many places, I had assumed that in Spain, education would have more emphasis. Hearing that "geography" and "science" are not considered "important" makes me sad, however, at least they are still being taught, unlike the US. And we sympathize with you on packing the backpacks every day. Cecilia also has block classes at school, meaning that we have to lug all of her books around. I am very interested in speaking with you as I am about to embark on this same journey ...kids and all. How did the kids fare with school in Spanish?